I take vitamins as insurance in case I don’t eat enough. I still take a prenatal vitamin and I also take extra calcium. I am looking into adding DHA and Omega-3, also. I used to be really good about taking my vitamins, but last year I totally dropped the ball. It’s time to get back to taking vitamins! I am also adding in probiotics. I have relied on caffeine too much to help me deal with my extreme exhaustion. On top of that, I have gotten out of the habit of drinking enough water. I am now carrying around a large cup that I can refill throughout the day to make sure I am getting enough water. I have been dealing with a UTI here lately and I am convinced part of it has to do with my lack of water intake. Time to ramp that up! I can go half a day without eating anything. I just don’t like to eat in the mornings, but it is necessary and I always feel better when I do eat in the morning. I am also looking back into Trim Healthy Mama . 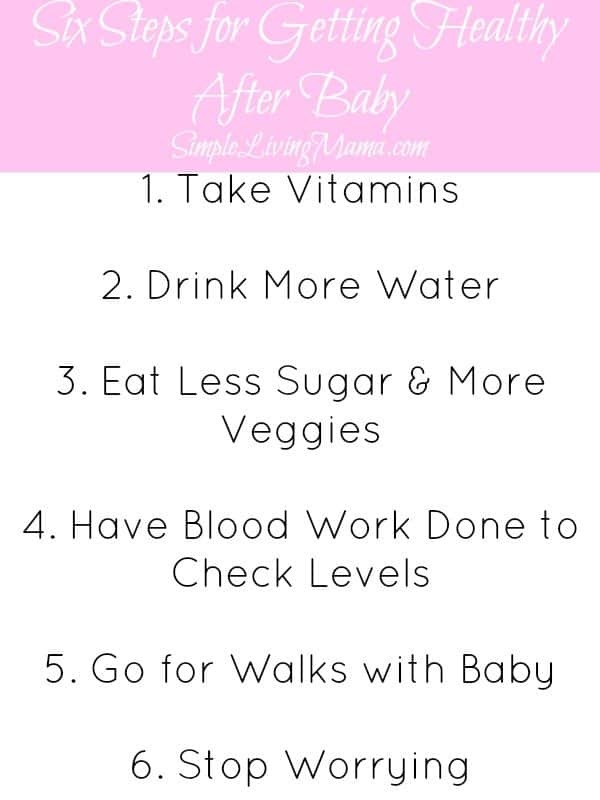 I actually started this diet a year ago to lose my baby weight. I ended up getting a nasty stomach bug and couldn’t stand some of the foods for a long time after that. I have actually lost nearly all of the baby weight, but I know I need to eat better in order to feel better. I’m sure I won’t be a devout follower of THM because I do not need to lose weight, but I do want to incorporate some of the principles into my diet. I need to cut way back on the sugar and eat more veggies and healthy fats. I am going to the doctor soon and will be requesting blood work. I want to see where I am with everything. I have read that thyroid problems are common after having babies. We have moved to a very exercise friendly neighborhood and I need to take advantage of that. Exercise makes me want to groan just because it is so difficult to do with the kiddos, but I know that once I actually do it, I feel much better. I have worried about everything most of my life and that contributes to poor health. I am trying to make a concentrated effort to let go of the things I cannot control. There is so much not in my control and there really is no sense in constantly worrying about everything. So, these are the things I am doing right now to hopefully feel better. As mamas we have to take care of ourselves if we want to take care of everyone else. I have found out quick if I’m sick there really is no one who is going to take care of me, and I have to just continue on with everything that I normally do all while feeling horrible. I’d rather just not feel horrible. Disclaimer: This post is for informational purposes only. I am not a health professional. I am just a mama sharing what I am doing in my own life. You should always consult a doctor if you feel you have a health problem and before beginning a new diet or workout regimen.